It's been almost a year since I posted last, it's crazy. I got so absorbed into working on Jem and the Holograms and trying to get it all finished. It's all done now, though, last night I finished my final issue for the time being. I can't believe I worked on Jem for about a year and a half, and it doesn't seem like that long, time really flies. Anyway, now that Jem is done, that means I'm FINALLY going back to work on Wet Moon 7!!! The rest of 2016 is pretty wide open for me so hopefully I'll be able to get in a good 6+ months of work on WM7. I'm going to be rewriting a bunch of it and probably redoing most or all of the pages I had drawn so far. 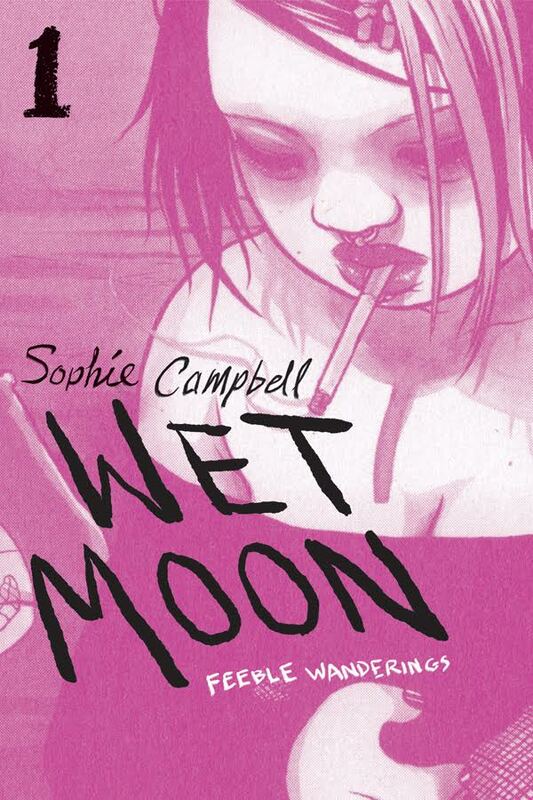 I completely forgot to post here about the new edition of Wet Moon volume 1 that came out recently! It has my name fixed on it and a new cover designed by Annie Mok, as well as some extras in the back like character profiles and some fanart. We're re-releasing each book one by one, it'll be so great to have new editions with my name updated on them all and nicer paper stock and all that. You can get it at all the usual booksellers like Amazon and also digitally at Comixology. I think I might move this blog to Tumblr or another platform, Blogger is kind of a hassle to use... I don't know, I'll think about it. I wish Livejournal would come back into fashion, that was such a fun site. What I REALLY need to do is get my personal website redesigned and back up and running. What a pain! Thank you as always for being so patient, you guys!! Hi Sophie! I recently read Wet Moon 1-6 (as in I was told about it on Sunday and had finished it all by Tuesday lol), and just wanted to let you know how much it meant to me to find a book like this. Though I'm not even sure how to put it into words, it's just So Much. To find such a book full of all different kinds of girls of all different body types and races and romantic/sexual orientations.. it shouldn't be that rare, but it really is. And yours is so beautifully written and drawn as well. I was sucked in immediately and can't wait to see what's next. I'm so excited for however you evolve the story. Thank you so much for giving us these books and for letting me finally be able to see a bit of myself through characters in a medium that I really love but have found so rarely representational. Hey siphia, I am so glad to hear that wm 7 is getting some attention.lol. I have been a fan for years, waiting patiently each year for the next release of WM. I cant wait til vol 7 is finally completed snd released. Eee!!! Such good news! I jumped up and spooked the cat when I read this. Thanks for this excellent series. I'm totally hooked. The odd characters remind me of my old high school groups. I'm in love with the visual style and the tone. Very much looking forward to WM7.